Twenty years after she was imprisoned and chained in a coffin-size box as a child, Katie Beers said getting kidnapped was a blessing in disguise because it allowed her to escape a life of abuse. Beers, now a 30-year-old married mother of two living in rural Pennsylvania, is breaking her decades-long silence with the release of a memoir co-written with WCBS News reporter Carolyn Gusoff called "Buried Memories: Katie Beers' Story" (Title Town Publishing). The kidnapping had gripped the nation in the early 90s. The last words the public heard from Beers were in 1993 in a terrifying phone message, according to WCBS-TV. "Aunt Linda, a man kidnapped me and has a knife, and oh no, here he comes right now," she said. That man was John Esposito, her neighbor. He held her in a dungeon hidden below a slab of concrete in his Bay Shore, N.Y., home, abusing her sexually and emotionally for 17 days. After Esposito admitted to kidnapping Beers on Jan. 13, 1993, the girl was placed in foster care and raised her in an East Hampton home with four siblings. Her foster parents shielded her from the media, so Beers has barely been seen or heard since then. She is going public for the first time with her memoir and media tour. "The best thing that happened to me," Beers told The Associated Press about her abduction and subsequent rescue. "I would have never gotten out of the abuse situation I was in." In an exclusive interview with WCBS in New York, Beers described what it was like to have all those repressed memories resurface. "I just believe that if you are in an abusive situation, emotional, physical, sexual, spousal, whatever it might be, you need to get out of that situation," she said. "Find somebody to talk to, because if I didn't have somebody to talk to about the abuse I sustained, my life would be a completely different situation." Beers told WCBS many things help her overcome the horrors she suffered: Her East Hampton foster family, her therapists, graduating college and her loving husband. While researching for her memoir, she communicated with Esposito, who is now serving 15 years to life in prison. "I know I'm guilty of my crime, but I believe I've been punished enough. I mean I didn't kill anyone, and when I started my crime, I really thought it would be good for both of us," he wrote. In the book, Beers writes she had been molested and raped by Sal Inghilleri - her godmother's husband - from the time she was a toddler. Inghilleri, who served 12 years in prison for molesting Beers, died in jail in 2009 following his arrest on a parole violation. Beers also writes that Esposito raped her in the dungeon, explaining that she repressed her memory of the sexual assault for many years as a defense mechanism. 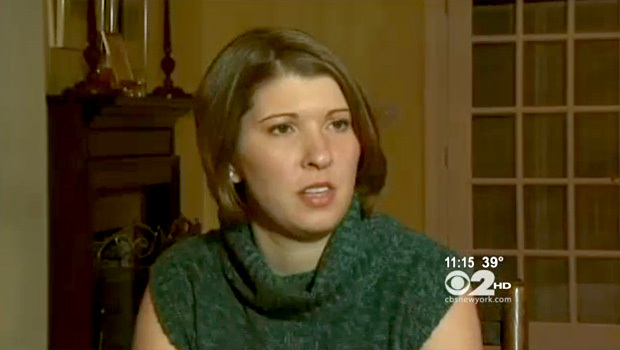 "I told him if he would release me I would run away and not tell the police," she told WCBS. "I remember asking John how I would have children. He said I'd have children with him. I said no." During her time in the dungeon, Beers writes, she rarely slept, fearing abuse from Esposito. She said she was afraid Esposito might molest her while she slept, but also was concerned that he would photograph her sleeping and send the image to police. She feared if police thought she was dead, they might end their search for her. She "celebrated" her 10th birthday while a prisoner of Esposito's and was heard on an audiotape found in the dungeon after her release singing "Happy Birthday" to herself, although she says today she has no recollection of that. Esposito, she writes, fed her primarily junk food and soda; to this day she is repulsed by chocolate after-dinner mints because they were a staple in captivity. She did have access to a small television, but says she can no longer listen to Whitney Houston's version of "I Will Always Love You" because it played incessantly on MTV and VH1 while she in the dungeon. She didn't realize it until many years later, but says now that she frequently watched Gusoff -- then a reporter for Long Island's News12 cable station -- filing reports on the police search for her while she was missing. "It was like I had known her for 16 years" when they met in 2008 to begin work on the book, she said. Gusoff notes that as abhorrent as Beers' sexual abuse and neglect was at the hands of her elders before the kidnapping, it may have steeled her into a survival mode. Dominick Varrone, the Suffolk County detective who led the investigation, agreed, telling Gusoff in the book that "because of her upbringing, the sexual experiences, the abuse, and street smarts and toughness, she was much more advanced than the normal 9-year-old, and we believe that contributed to her survival." Marilyn Beers, who is described in the book as a hard-working but largely absentee mother who ceded responsibility for raising Katie and her older brother to Inghilleri's wife and others, did not return a telephone message seeking comment about the book. "I hope that more does come out of the book," Katie Beers said. "I would love to be able to help other kids or adults or to be an inspirational or motivational speaker, something like that. But if I go back to my life in rural Pennsylvania and go back to my insurance sales job I would love that, too. "I'm very happy with where I'm at."